If you're trying to choose a smart speaker with high-quality audio, Apple's HomePod and Google's Home Max are great choices. If you're not willing to spend 350 to 400 dollars on a single speaker, then the Sonos One is the perfect choice for you. You can also check out our HomePod vs. Sonos One comparison. First of all, if you don't own an iPhone, you should probably just go with the Google Home Max, since it supports both aAdroid and iOS. The HomePod is a really great speaker, but it definitely has its limitations. Siri is undoubtedly worse than both Amazon's Alexa and Google Assistant. However, on the HomePod, everything's encrypted, so even Apple has no idea what you're saying to it. This is why the HomePod doesn't have a mute switch like the Google Home Max does. On the other hand, it has a pretty big flaw —it can't register or recognize multiple voices. So if you have personal requests turned on, anyone can ask Siri to read your messages. Luckily, those things can be fixed with software updates. What can't get fixed, however, is hardware, so let's talk specs. 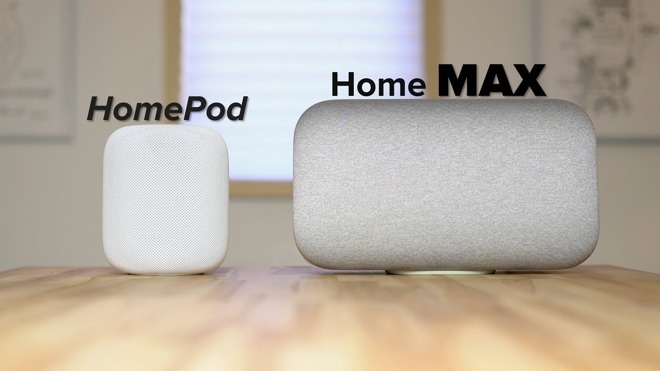 The Max is over twice as heavy as the HomePod, coming in at 11.7 pounds compared to 5.5. The HomePod is very compact compared to the Max, so it has more flexibility for placement. The HomePod has seven tweeters and one subwoofer. The tweeters are horn-loaded, and can focus sound in 360 degrees around the HomePod. The Max has two subwoofers and two tweeters that face frontward, so you're forced to put it against a wall or in a corner if you want the best results. Both speakers use six far-field microphones to detect the space they're in and automatically balance sound output, but there's not much to balance on the Max compared to the HomePod, since all the speakers are facing one direction anyways. The HomePod has a 4-inch woofer compared to two 4.5-inch woofers on the Max, but the HomePod uses special technology that allows for 20 millimeters of woofer travel compared to only 11 millimeters on each woofer in the Max, so this single woofer should be able to hold its ground. The Max has a 3.5mm Auxiliary port, as well as a usb-c port that can be used for a wired internet connection. The HomePod has neither, but it does offer more touch controls compared to the Max, which can only pause/play and adjust the volume. You can double tap the center to skip to next track, triple-tap for the previous track, and tap and hold to invoke Siri. The Max can be placed horizontally to play stereo sound. It comes with a magnetic rubber pad so you can easily place it vertically, which will automatically switch the Max to mono mode. Unlike the HomePod, the rubber pad won't leave a white ring on furniture. The HomePod can actually reproduce stereo sound by splitting channels between its 7 tweeters. But as you can tell, stereo works better on the Home Max since it actually has 2 sets of speakers side by side. You can also pair two Home Max speakers, either horizontally or vertically, and they will work in stereo. You can place them in different rooms for multi-room audio by creating audio groups, which can contain any combination of google home or Chromecast audio devices. You won't be able to natively pair two HomePods for true stereo sound and multi-room audio until AirPlay 2 is released. We were actually able to pair two HomePods without using Airplay 2 by using a couple of methods. The Max supports voice control for music services such as YouTube Music, Spotify, Pandora and Google Play Music. Home Max doesn't support Apple Music, but it can play it using Bluetooth. Volume wise, the Google Home Max completely blows the HomePod out of the water. There is definitely some distortion to be heard past 80 percent volume on the Home Max, especially in the highs. Most people wouldn't listen to it past 80% volume unless they're hosting a house party or watching a movie on their TV using Chromecast. Also, at least 80 percent volume, the Max has a very hard time hearing commands. This makes for an awkward situation if a guest comes and you have to run over to turn the volume down. The HomePod however, can also have some trouble, but only when maxed out. We set both speakers to 50 percent volume to test the sound quality. Interestingly, the HomePod beats out the Google Home Max in terms of bass. The Home Max sounded muffled at 50 percent volume, the mids just didn't stand out at all. We tested multiple songs, and the HomePod is hands-down the winner when listening at medium volumes. We played a very bass heavy song, and the HomePod did a great job of maintaining audio reproduction of high and mid frequencies during the bass notes compared to the Max. As you can hear, the bass on the HomePod is also much, much deeper. If you're into music and enjoy lots of deep bass, the HomePod is the better choice. In conclusion, the HomePod is the clear winner for sound quality, with extremely clear audio reproduction and no distortion at all. However, after listening to the Home Max, you really start to wish it could get at least a little bit louder. If you aren't planning on blasting the music on your new smart speaker, and enjoy listening at lower volumes, the HomePod is definitely the right choice. The Home Max's highs are definitely louder and brighter at higher volumes, so if you really enjoy sharp highs, then get the Max. Fortunately, there isn't enough of a difference between the two to justify buying one or the other for sound quality reasons alone. If you really care about the smart side of the speakers, then the Google Home Max is the obvious choice. The Max doesn't natively support Apple Music and the Apple ecosystem, yet that's the only thing the HomePod natively supports. If you already have an Apple Music subscription, definitely buy the HomePod. If you've got a subscription for any other music service that's supported by Home Max, and don't think it's worth switching over to Apple Music, then definitely buy the Home Max.